Deposit £10 get £50 bonus at Coral! Editors note: One of the first things which will strike you in our Coral Casino review is their unique welcome bonus. New customers only have to deposit £10 into their account and they’ll be awarded an extra £50 bonus instantly. That’s a whopping 500% bonus on your money and the initial deposit is small enough that anyone can get in on the action. Working with that array of different providers is what allows Coral Casino to host its peerless selection of different games, which also includes a great variety of different types of slot. Different numbers of reels and both video and traditional slot options, therefore, are well catered for. Progressive jackpots, too, are heavily featured and include alternatives with all different sizes of top prize. Amongst the most interesting and popular of the slot games at Coral Casino are those themed after Marvel films or popular TV shows like The Chase. Play slots at Coral & get your Deposit £10 get £50 bonus! New customers only, 18+, T&C's apply. The promotion run for brand new Coral Casino customers is one of the simplest around and as such is impressively easy to understand. Any new customer who deposits at least £10 and claims their bonus will be credited with bonus funds worth £50. 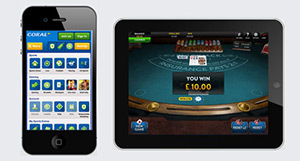 Visit coral.co.uk/casino on your PC, laptop, smartphone or tablet. Click or tap the green ‘Join Now’ button featured toward the top right hand corner of the Coral home page. That will take you to a registration form, where you need to fill in the requested details and then select the green ‘Next’ button. Once your new Coral account has been created, make sure to deposit at least £10. Head to the promotional page of the Coral site and select the ‘Claim Now’ option. Agree to the terms and conditions when prompted to by way of a popup message. £10 from your balance will be devoted to the bonus and bonus funds worth £50 will be credited to your account’s ‘Casino Bonus Section’. Get your Deposit £10 get £50 bonus with Coral Casino! The promotion is available to Coral customers who have never before claimed a welcome bonus. In order to receive their £50 worth of bonus funds, a customer must have at least £10 in their account and must select the ‘Claim Now’ link on Coral Casino’s promotional page. Customers must also accept the offer’s terms and conditions when prompted to do so. The £50 bonus must be wagered at least 24 times before any withdrawal is possible. Play via the Coral sportsbook or the company’s bingo and poker clients does not count towards wagering requirements. Coral Casino games do not contribute to the wagering requirements equally. 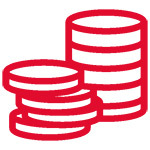 Contribution weightings for different games are as follows; slots, arcade, scratch card and fixed odds games contribute 100%; roulette, blackjack (excluding Pontoon, Blackjack Switch, Blackjack Surrender, Lucky Blackjack, Stravaganza and Video Poker), sic bo, keno and craps contribute 20%; Red Dog, Spin A Win/Lucky Wheel, Casino War, Casino Hold’em, Wild Vikings, Let Them Ride, Stravaganza, Pai Gow and 60 Seconds contribute 5%; Castle Builder, Baccarat, Pontoon, Blackjack Switch, Blackjack Surrender and Lucky Blackjack (All variations), Dice Twister, Rock Paper Scissors, Golden Tour, Around the World, Highway Kings, Funky Monkey do not contribute. The bonus expires after 28 days. If wagering requirements have not been completed by then, any unused bonus funds and any related winnings will be removed from a customer’s account. If a customer attempts any withdrawal before wagering requirements are completed, the bonus is made void. Any customer with an active bonus who wins more than twice the amount of that bonus must remain playing a game with similar or equal weighting until all wagering requirements are fulfilled. A customer cannot bet more than 20% the total value of their bonus (£10) on a single bet or game round for the duration of the bonus, or else the entirely bonus is invalidated. The bonus is not available for customers resident in the following countries; Albania, Belarus, Czech Republic, Georgia, Hungary, Liechtenstein, Lithuania, Macedonia, Romania, Russia, Slovakia. For full welcome offer T&C’s visit the Coral casino. A Coral Casino service almost identical to that offered by their desktop website is also available via mobile devices and tablets. Coral, in fact, provide all of their betting options by way of an integrated mobile offering which can be accessed via any device’s web browser. A dedicated app for iOS controlled devices is also available to be downloaded through the App Store. Coral’s mobile offering is arguably the very best such service around, and as such boasts a huge number of positive features. Providing for sportsbook betting, casino gaming and live casino options all in one place, the app still manages to be well laid out and intuitive. That makes it impressively user friendly and ensures that all manner of different games can be accessed quickly and easily. The selection of games provided to mobile users is another major plus point for the Coral Casino app, too. The sheer number of games runs into the hundreds, and includes traditional casino games, video slots, progressive jackpot slots and live dealer options. What’s more, certain games such as Rainbow Riches, Thai Flower and Crown Gems are exclusive only to Coral’s mobile site. As if all of that weren’t enough, too, Coral mobile users can also benefit from any excellent range of promotions and bonuses. As you may guess from the above, there are very few criticisms you can level at what is an excellent Coral Casino mobile app. One slight issue that does arise, however, is the fact that the mobile site can take a little time to load and to change from one category to another. Generally speaking, though, that is a small price to pay for all of the excellent features that the app does provide. Get app & deposit £10 get £50 bonus! As a giant of UK betting and gaming, it should come as no surprise that Coral Casino’s customer support is amongst the very best around. For all manner of simple or commonplace issues and queries, a Coral customer’s first port of call would be the company’s online help centre. That help centre is a combined tool for Coral’s casino, sportsbook, poker and bingo customers, and is populated with a huge number of different articles and FAQs. Those articles and answers encompass a wide array of different topics, including depositing money, making withdrawals, specific game rules and responsible gambling, amongst others. If those varied help pages don’t satisfy a punter, however, there are also a number of other ways in which they can seek help. The Coral Casino website features a live chat feature that can be accessed by just one click from the help centre, and allows a punter to message a member of the company’s customer support staff instantly. Email messages, too, can be sent via an integrated tool on the Coral site and three separate helpline numbers are made available for UK customers, Irish customers and those from elsewhere in the world. The Coral Casino is operated by a company called Coral Interactive (Gibraltar) Limited. In line with the norm amongst online casino providers, that company is incorporated in Gibraltar and has a registered address at Suite 711, 1st Floor, Europort, Europort Road, Gibraltar, GX11 1AA. When providing their service to customers based outside of the UK, the company is licensed by the government of Gibraltar and regulated by the Gibraltar Gambling Commission. For customers resident in the UK, meanwhile, the company is licensed and regulated by the Great Britain Gambling Commission. As well as that licensing and regulation, Coral Casino is also a registered Independent Betting Arbitrage Service (IBAS) provider. That means that the company has been certified by that independent, third party service as providing a fair and above board service to customers. ite boasts an SSL encryption certificate from market leading provider Norton. The service provided by Coral Casino is an exceptionally impressive one that at least matches, if not betters, the alternative provided by many of the company’s main competitors. By working with a wide array of different software providers, Coral Casino manage to offer a huge variety of different games of all types to their customers. Those games include literally hundreds of slots and a good selection of live dealer options, too. What’s more, Coral Casino’s new customer promotion offer is also an interesting and a generous one. In spite of its value – at £50 – being a little lower than some bonuses available elsewhere, after all, the fact that it is worth 500% of the amount need to trigger it is really impressive. Perhaps the most notable feature of Coral Casino’s service, however, is its peerless mobile offering. Boasting almost the exact same selection of games as the desktop site and an intuitive and attractive layout, Coral Casino mobile customers truly are well served. Deposit £10 get £50 bonus!